A contrast medium called Sodium Fluorescein is injected into a vein in the arm. The dye travels quickly through the body's circulatory system, and is photographed with black and white film as it travels through the eye. The same camera which is used for fundus photography is employed for this procedure. Two special filters are used to limit the image to the color of light being emitted from the fluorescent dye. 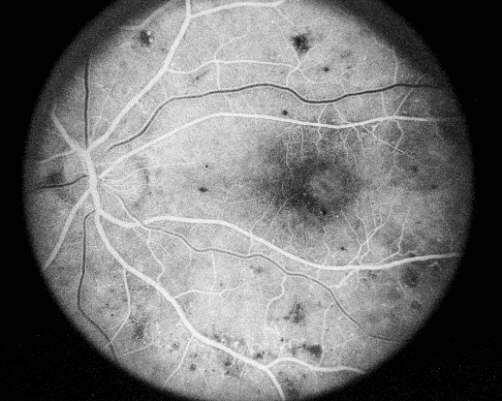 About twelve seconds after the injection, the dye appears in the arteries of the retina. Over a two to five second period, the dye travels through the very small vessels, or capillaries, and fills the veins. Ten minutes after the injection, the dye has mostly evacuated from the eye, having stained the optic nerve head. This normal progression of dye is interrupted by many diseases of the choroid, retina, and retinal vasculature. 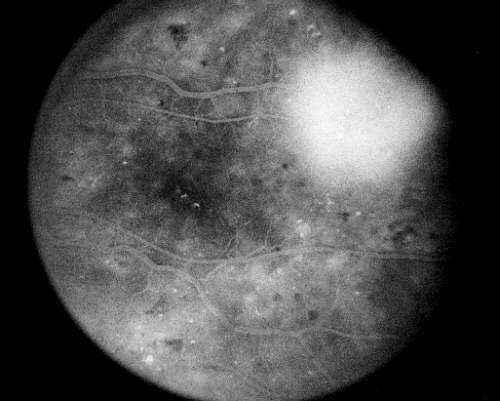 A fluorescein angiogram of a patient with ocular complications due to diabetes (diabetic retinopathy) reveals vascular irregularities when compared with the normal angiogram. 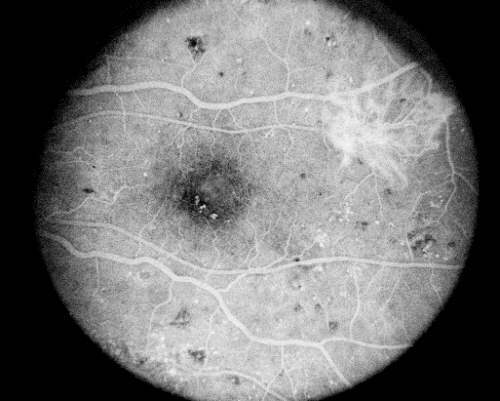 Fluorescein angiograms are used in the COMS primarily to determine the effects of radioactive plaque treatment on vision in patients with medium sized tumors. Copyright © 1996, 1999, 2000, The Collaborative Ocular Melanoma Study.